Sports fans are interested in more than just your season schedule. Sure, that is the number one reason why fans will subscribe to your 'digital calendar', however you best not stop there! The average sports client on the ECAL platform promotes around 5-6 'schedules' of content, and that can offer a nice broad selection of content - including various game schedules, broadcast schedules, corporate events, community program events, and events for special interest groups (eg: Women's networking, cheerleaders or coteries). Additionally, as fans choose their schedule preferences, they effectively self-profile. This will help you develop a 360-degree view of the customer, and help fuel a more 'dynamic CRM' framework. It will ensure any further communications you send to a customer is tailored to meet their specific interests. Leading sports brands like Tottenham Hotspur FC and Washington Redskins have as much as a dozen schedule choices, with good reason. By offering a selection of great content, you allow your audience to keep up-to-date with events that specifically interest them - events they likely didn't know existed in the first place. These top brands are also using content schedules to prompt sales interest, with schedules for 'Ticket On-Sale Dates' proving hugely effective. To demonstrate the point, the first image above shows the schedules offered by an ECAL football client, and the percentage of users who subscribe to each schedule. There are a total of 38,000 subscriptions in total at the time. As you can see, 29% of users subscribe to 'Bronze' category ticket dates, 23% to 'Member' ticket dates and 28% to 'General Public' ticket dates. Additionally, 20% are interested in 'Events & Offers'. Now click the right arrow to view the next image above. This graph shows exactly how these ticket on-sale dates stimulate click-throughs and purchase intent straight from the calendar. You can see distinct 'click-through' peaks generated specifically by the 'Bronze' and 'Member' ticket on-sale entries appearing in the fans' calendar. These ticket on-sale date entries let fans know exactly when they can purchase tickets for upcoming games, with instant and direct access to purchase tickets via embedded links. Timely reminders are set beforehand, so the fan has time to consider and prepare to engage, and purchase. As you can see, fans are interested in so much more than just the games! 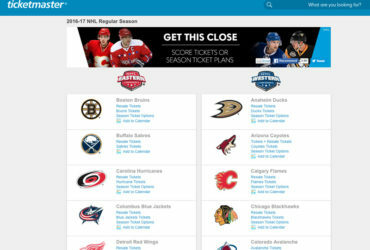 The calendar is a very powerful channel to stimulate buying intent for tickets, and for other high value sales like season tickets, merchandise / team gear, online video subscriptions, Christmas gift ideas and more. NHL Ticket Alerts go live! ‘NAB to Calendar’ increases on-time payments by up to 12%!